Keep cans and bottles out of direct sunlight. Placing them in a hot vehicle can cause them to explode. 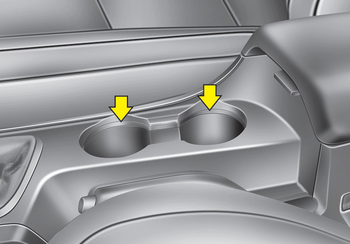 Do not place uncovered cups in the cup holder while the vehicle is in motion. If the liquid spills, electric systems may malfunction. Keep your drinks sealed while driving to prevent spilling your drink. 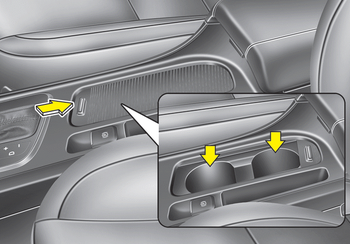 If liquid spills, it may get into the vehicle's electrical/electronic system and damage electrical/electronic parts. When cleaning spilled liquids, do not dry the cup holder at high temperature. This may damage the cup holder. To use the cup holder, open the cover. 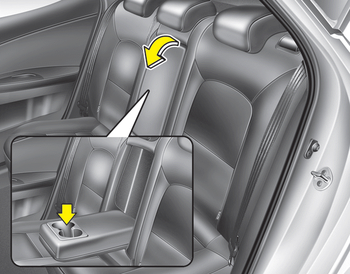 To use the cup holder, pull down the armrest.